Billy Fury, one of Britain's answers to Elvis back in the 1960s, deserved better than this dumb confection, which failed to do for him what similar threadbare flicks did for Cliff Richard. Coronation Street fans might enjoy watching Amanda Barrie in her movie heyday, and connoisseurs of trivia will note that the director Kenneth Hume was married to Shirley Bassey at the time, while dedicated followers of fashion can admire the 1960s clothes. 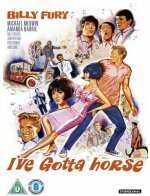 However, nothing can take your mind off the terrible plot of "I've Gotta Horse", as singer Fury misses rehearsals to watch his racehorse run in the Derby. If you care, the title was the catchphrase of colourful racetrack tipster Ras Prince Monolulu, a now-forgotten minor celebrity of the period.